Sarny, the young slave girl who learned to read in Nightjohn, is now a young widow. 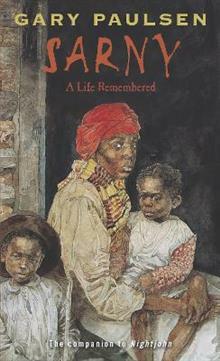 She flees the plantation in the last days of the Civil War, a free woman in search of her sold-away children. Sarny's story gives a panoramic view of America in a time of tragedy, trial, and hoped... read full description below. So many readers have written and asked: What happened to Sarny, the young slave girl who learned to read in Nightjohn? Extraordinary things happened to her, from the moment she fled the plantation in the last days of the Civil War, suddenly a free woman in search of her sold-away children, until she found them and began a new life. Sarny's story gives a panoramic view of America in a time of trial, tragedy, and hoped-for change, until her last days in the 1930s. From the Hardcover edition. A satisfying sequel...It is a great read, with characters both to hate and to cherish, and a rich sense of what it really was like then. -- Booklist, Starred <p> From the Hardcover edition. Gary Paulsen is the distinguished author of many critically acclaimed books for young people, including three Newbery Honor books: The Winter Room, Hatchet, and Dogsong. He won the Margaret A. Edwards Award given by the American Library Association for his lifetime achievement in young adult literature. Among his Random House books are Road Trip (written with his son, Jim Paulsen); Family Ties; Vote; Crush; Flat Broke; Liar, Liar; Paintings from the Cave; Woods Runner; Masters of Disaster; Lawn Boy; Notes from the Dog; The Amazing Life of Birds; Molly McGinty Has a Really Good Day; How Angel Peterson Got His Name; Guts; and five books about Francis Tucket's adventures in the Old West. Gary Paulsen has also published fiction and nonfiction for adults. He divides his time between his home in Alaska, his ranch in New Mexico, and his sailboat on the Pacific Ocean.